The MCL is one of four major ligaments that supports the knee. This ligament is a strong broad band found on the inner aspect of the knee joint and is the largest structure situated on the medial side. The MCL is understood as being the most common ligament injury of the knee. This structure is divided into superficial and deep ligaments. The superficial ligament is also known as the tibiofemoral ligament whereas the deep ligament is identified as the mid-third capsular ligament. 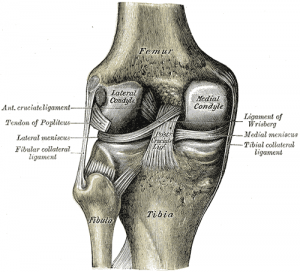 The superficial medial collateral ligament (sMCL) has one femoral and two tibial attachments. The femoral attachment is situated on the medial epicondyle. The proximal attachment blends into the semimembranosus tendon and the insertion of the distal attachment is at the posteromedial crest of the tibia. The Deep medial ligament (dMCL) is divided into two, the meniscofemoral and meniscotibial ligaments. The origin of the meniscofemoral comes from the femur just distal to the superficial medial collateral, inserting into the medial menisci. The meniscotibial ligament is thicker and shorter with an attachment forming on the distal edge of the articular cartilage of the medial tibial plateau coming from the medial meniscus. The medial collateral ligament is recognised as being a primary static stabiliser of the knee and assists in passively stabilising the joint. When stress is applied this ligament aids control in transferring the joint through a normal range of movement. The MCL also prevents an anterior movement of the tibia and hyperextension. The ligaments role also includes joint proprioception, when stretched beyond ability or are exposed to an excessive load, proprioceptive feedback generates a muscle contraction. The sMCL resists valgus forces applied to the knee through all degrees of flexion with the deep medial collateral acting as a secondary resistance. Specifically the primary valgus stabilizer is identified as the proximal division of the sMCL. The dMCL assists the knee in rotational stability primarily in extension moving through into early flexion. Through the predominance in injury to the MCL it is important to understand the functions of the structure so that the correct procedure or treatment can be applied. Injuries to the MCL can have detrimental effects to surrounding structures. 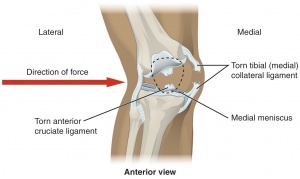 It is recognised that either partial or complete ruptures in the ligament significantly increases the load on the ACL. Partial tears show that increases in ACL load were identified at 30 degree knee flexion and valgus load and internal torque. The anterior aspect of the ligament can be palpated moving vertically, roughly midway along the medial joint line. The valgus stress test allows the therapist to examine the medial aspect of the joint for any laxity. An increase in laxity and joint space usually distinguishes damage to the medical collateral ligament. The patient should be positioned supine. By performing the test with the knee in approximately 30 degrees flexion rather than extension, this is due to the fact that flexion helps to relax surrounding structures including the posterior capsule. This ensures there is isolated testing of the MCL. Therapists position one hand on the lateral aspect of the joint line of the knee with the other hand on the medial aspect of the ankle. A valgus force is then applied, a positive result of the knee in this position would be an increase in joint space medially. ↑ 1.0 1.1 1.2 Atkins, E., Kerr, J. & Goodland, E., 2015. A Practical Approach to Musculoskeletal Medicine: Assessment, Diagnosis, Treatment. 4th ed. China: Elsevier.